Bermondsey has strong links with the West African nation of Sierra Leone, with a large community from that country having made their home in SE1 and SE16. Today simultaneous services of thanksgiving were held in St Mark's, Freetown, Sierra Leone and in St Anne's, here in Bermondsey, for the life of Irene Tunike Archibald. Sierra Leonean Christians hold such services 40 days after the death, taking their cue from the ascension of Jesus which took place 40 days after the resurrection. So today, 40 days after she died, Irene was commemorated this afternoon at St Anne's (where some of her UK family are members) and at St Mark's, Freetown, where she herself was a member. In Bermondsey we sung The Lord's My Shepherd, Ten Thousand Reasons, Blessed Assurance, When Peace like a River, and My hope is built in nothing less; her family brought tributes, God's word was read, Paul preached and I led the prayers - and following it all was a sumptuous feast of delicious Sierra Leonean food (see below) in St Anne's Hall. Bereavement's always hard, but its tougher still when you live half a world away from the person who died, so it was good that the UK branch of Irene's family could be joined spiritually this afternoon with the African branch, even if, physically, a whole ocean separated them. 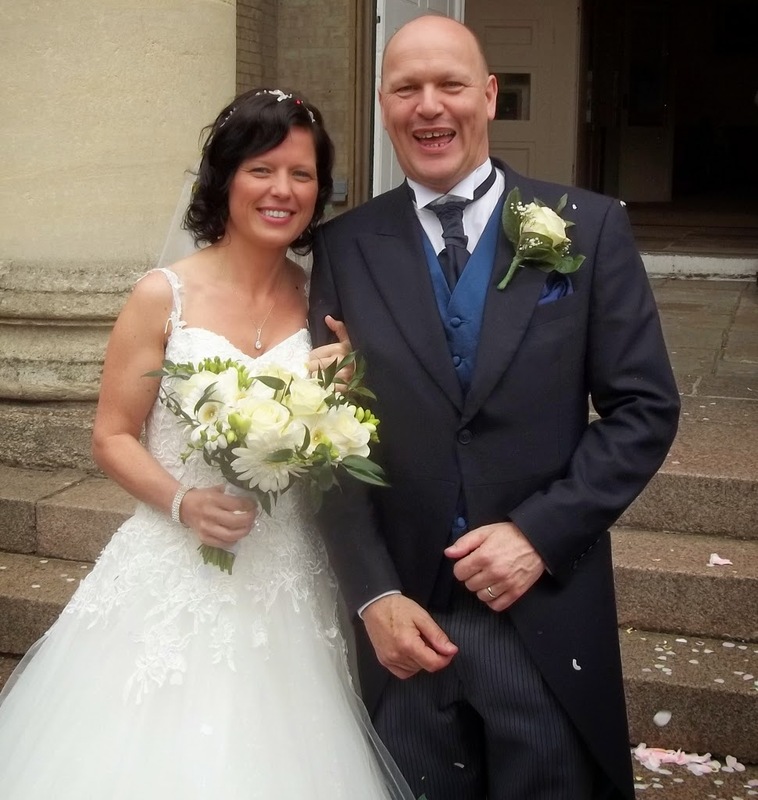 The bells were ringing out this afternoon for the wedding of Lesley and Freddie (left). God bless you both and all the family on your special day. Meanwhile this morning St James's welcomed a party of visitors from St James's Cathedral in Toronto, a church with a strong Bermondsey link. Our St James's has a new set of bells, installed in 1990, but the old set of bells were sold to the St James's Cathedral in Toronto where they form one of only two sets of 12 change ringing bells on the North American continent, providing a little bit of Bermondsey in the heart of Canada. When the young Simon Hughes moved to Bermondsey in the late 70s to work as youth leader he started attending St James's Church, which has remained his spiritual home to this day. In the immediate aftermath of the election, he asked if there could be an opportunity for a moment of thanksgiving and rededication in the service, and if this could be combined with a church lunch, on Sunday 17th May, which by happy coincidence, was also his birthday. And so today members of St James's and St Anne's, members of the prayer group that has met every month for 32 years to pray for Simon, Liberal Democrat councillors and colleagues, and many others gathered today for Holy Communion on the Sunday after the Ascension, and a service of thanksgiving for Simon's service as MP, followed by a rededication for the future. As members of the congregation arrived they saw immediately opposite the church the tribute by a Hicks House resident (right), which just about summed up the occasion. 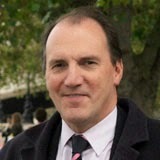 Then I read messages from the Bishop of Southwark ('I am delighted that this service of thanksgiving and re dedication is being conducted at St James and wish personally and on behalf of the Diocese to express heartfelt thanks and appreciation for Simon together with the assurance of my prayers for all that lies ahead') and the Dean of Southwark Cathedral ('You have been an exemplary constituency MP. Your local knowledge is second to none, your care and concern for individuals and especially the marginalised has been a witness and example to us all. 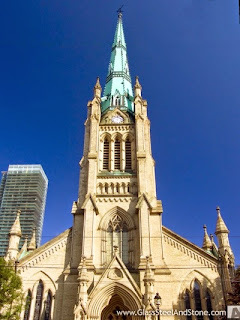 You have tried to be at as many events in the area as you possibly could, juggling a diary and time schedule, driving around in your yellow taxi, constantly giving of yourself...I know that all that you have done and stood for and will continue to stand for, comes from your deep love of Our Lord Jesus Christ'). At the end of the service, Simon knelt with his brother Jamie (taking up a new role as President of the British Psychological Society), to seek God's blessing for the future. 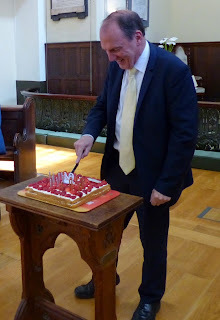 Then we sang the hymn Simon had chosen for today ('Lord for the years your love has kept and guided, urged and inspired us, cheered us on our way), but not before the congregation had given him a standing ovation, and the birthday boy himself got to cut the first of a whole stream of birthday cakes. Afterwards someone said this to me: it's unusual to find a place where the MP has been so loved. Southwark Music Services's Primary School Workshop drew children from St. George's Primary School, Cumber Grove Primary School, Lyndhurst Primary School as well as our very own St. James's School. 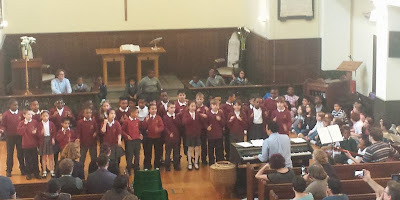 The children rehearsed all day and the day ended with a concert for the parents at 1.45pm. They gave such a magnificent and brilliant performance to an appreciative audience. Yesterday we hosted a 'context day' for 17 trainee Readers. 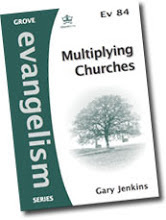 Readers are lay preachers within the CofE. 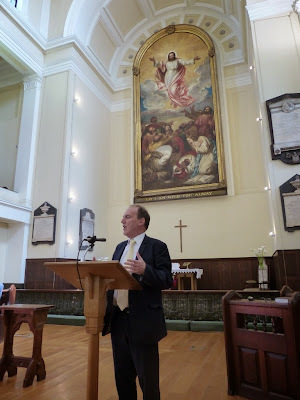 The Readers, along with the tutor, Simon, were in Bermondsey for the day to learn about our work as a united benefice and to see how the work of mission and ministry works out on the ground. It was good to meet them. As well as talks, videos, worship and discussion, the day included a guided walk around both parishes and that perfect complement to a Bermondsey day: lunch at the Blue. 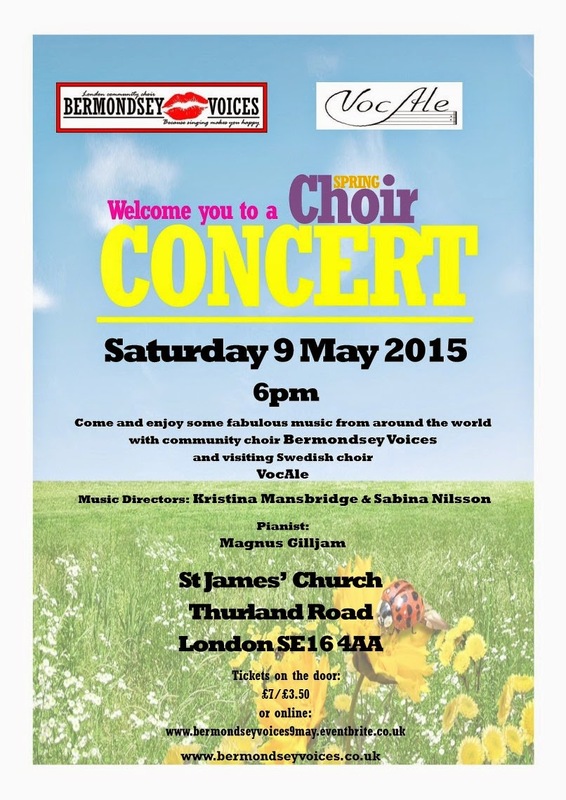 Later that day, our local community choir which rehearses each week in St James, Bermondsey Voices,treated us to a wonderful concert, which included contributions from a visiting church choir from Sweden. The Swedes brought us the hauntingly beautiful, Summer Hymn, often chosen by wedding couples in their home country, Bridge over Troubled Water, and a Swedish version of Psalm 23. 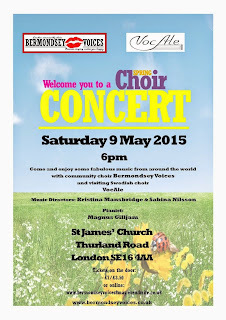 Bermondsey Voices kept the Swedish theme going with a couple of Abba numbers. Their repertoire ranged far and wide from Mozart to Vaughan Williams, including the choir's own tribute to Bermondsey heroine, Ada Salter. Then this morning we had a full church, overflowing to the gallleries, for the baptism of seven children aged 9 months to 12 years. Congratulations to Jace, Noah, Cameron, Mitchell, Sophie, Amelia, and Aaliyah. 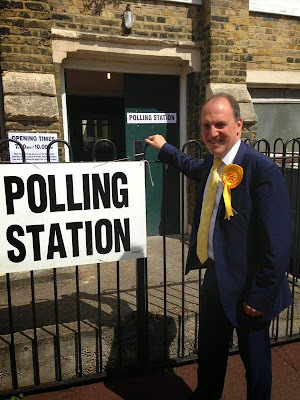 At last night's count, his victorious opponent, the new MP, Neil Coyle, paid tribute to Simon and this was followed by sustained cheers and applause from the crowd. 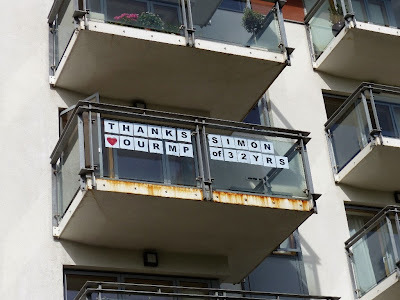 This is not a political blog: it is a pastor's blog, and it's as a Bermondsey vicar that I want to pay tribute here to the remarkable service that Simon has given to the community for 32 years. His energy, his commitment, his compassion, have been legendary. 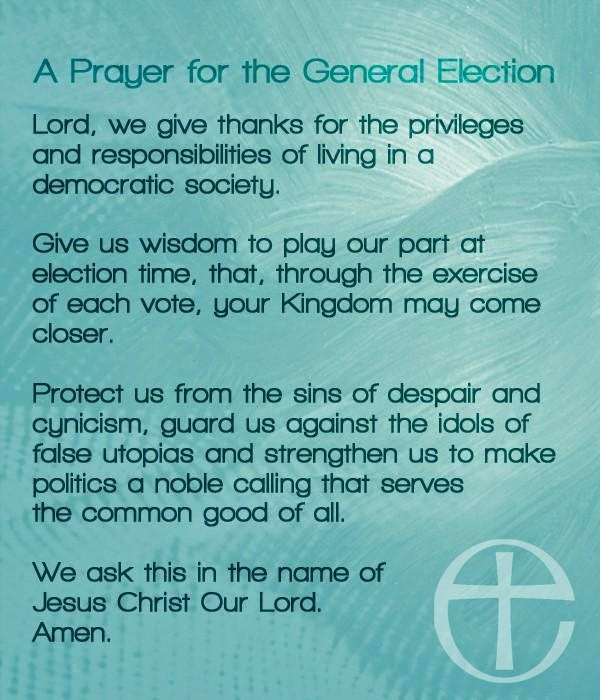 We honour him for all this today, and we pray for him - as we pray for Neil as he takes up his new responsibility. It's a promise for every Christian, and its a promise that I pray will sustain our dear brother, Simon, at this particular moment in his service for God's kingdom. 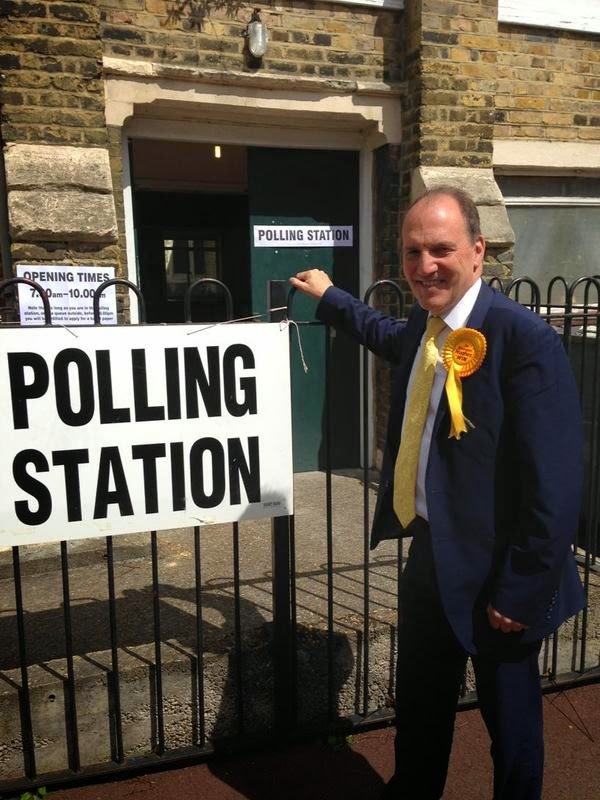 Here's Simon Hughes voting at St Anne's this morning. 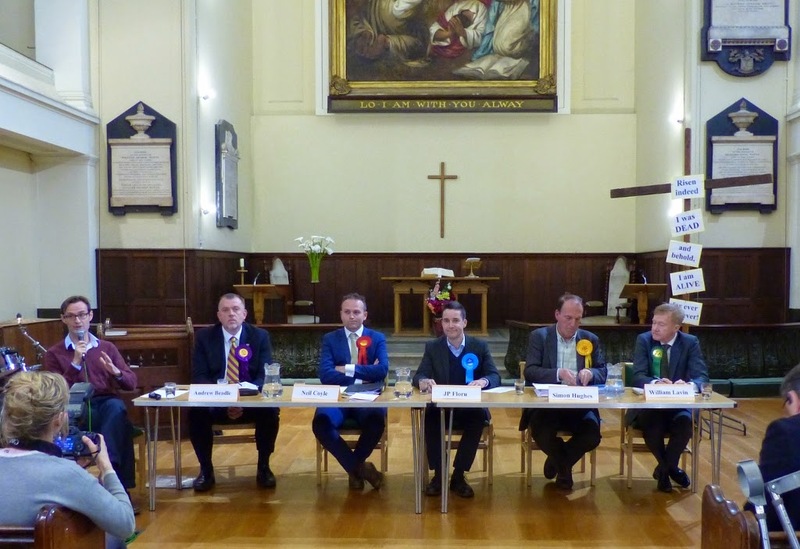 St James's Church was packed tonight for the General Election hustings organised by Christians for Transformation in Bermondsey and Rotherhithe. Brilliantly chaired by Julian Kelly, a senior civil servant who worships at City Hope Church, the panel was made up of the parliamentary candidates for the Conservative, Green, Labour, Liberal Democrat and UK independence parties. Two further candidates spoke from the floor. 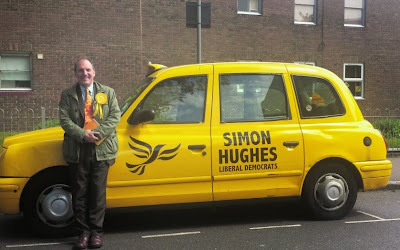 There was lots of good questions (some handed in before), others posed as supplementaries by the audience, all creating a lively debate for this, the last hustings before the election in our constituency. The event was live-streamed by the SE16 website and will soon appear on YouTube. 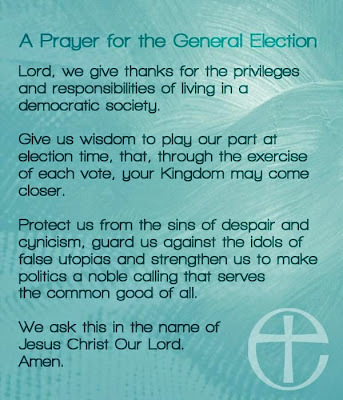 At the end I prayed for the candidates, for God's blessing on all the people of Bermondsey and Old Southwark, and that God's will might be done on earth as it is in heaven. 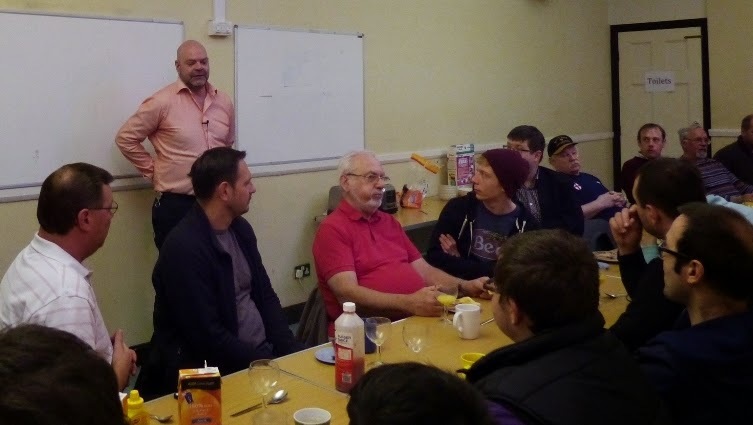 Robber turned preacher, Paul Fitzpatrick, spoke at this morning's men's breakfast at St James. Usual feast of bacon, sausage, mushrooms, beans, egg, toast, juice , tea, coffee etc. Great turnout plus a speaker with a remarkable real life story. Paul had been a robber. Paul had been a violent man. But one night listening to a Christian radio station in his prison cell, he had an experience of the reality of God's love for him that changed his life forever. It was as if the speaker (on the radio) was talking to him directly. It was as if a whole new world suddenly opened to him - right there in his cell. In time he was selected to train for the Church Army and much later went on to lead the charity, Prison Fellowship, that had helped him to readjust to life outside when he emerged from prison many years before. The great thing about Paul's story is that it reminds us that God's can reach people wherever they are and whatever they have done - and that God's love has the power to transform lives - forever.